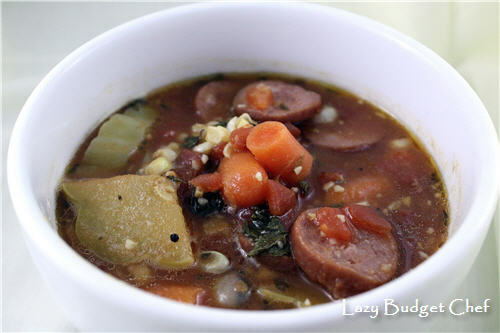 One my favorite cold weather dinners is a good, filling crock pot stew. To save time in the morning, I often load up the slow cooker and put it in the refrigerator over night. The next morning I pop the crock in the cooker, turn it on, and let it do its magic. A warm treat on a cold winter's night. I made this stew mostly from vegetable and herbs I froze from our summer garden. That’s why I call it Taste of Summer Stew. We didn’t grow the sausage, obviously. It was in the back of the freezer from last summer’s we-have-a-new-grill-let’s-cook-everything-we-can-to-break-it-in food frenzy. I started with one can of diced tomatoes with jalapeños for a little kick and one can of tomato sauce. Next came the fresh frozen vegetables - diced carrots, delicata squash, and a few handfuls of frozen CSA corn I cut from the cob. Next came the sliced smoked turkey sausage, crushed homegrown basil, and the last the homegrown oregano. (Mental note: plant more oregano next summer.) I shelled some frozen homegrown scarlet runner beans and tossed them in too. I’m sorry I don’t have exact amounts for you to write this up as a proper recipe. Although I measured and added ¼ teaspoon of sea salt to bring out the flavor of the vegetables. I let my stew simmer for 8 hours on low. I served it with homemade Russian Black Bread instead of crackers. I decided on bread instead of crackers because that's what I had. In true Lazy Budget Chef fashion, I didn't want to run to the store while it was snowing just to buy crackers. It felt like a little bit of summer on a cold winter's night. Husband and I marveled how we grew most of the ingredients in the meal because we most certainly aren't the big gardeners like his parents. We finally "got" the appeal of vegetable gardening. One of the unexpected benefits is being able to enjoy the fruits of your summer labor during the winter - when the variety of fresh fruit and vegetables is low. My Taste of Summer Stew was an experiment that turned into a happy accident. I would love to have you link this up to my party at http://scrapbookingez.blogspot.com/2012/01/anything-goes-linky-party_19.html. Thanks so much for sharing, this looks delicious! My Lunch is Boring, Can You Help? How Do You Survive on a Lactose Free Diet?